Tata said a "comprehensive package of proposed solutions" had been submitted. Llanelli AM Lee Waters and unions Community and Unite have all raised concerns. The Trostre plant employs 650 people and produces steel packaging for Tata Steel. Lee Waters, AM for Llanelli, said: "It is sickening that it comes to us again to have to offer up the sacrifice. We are pawns in a global chess game here. "The other worry for this is that Tata in Wales and the UK is an ecosystem. 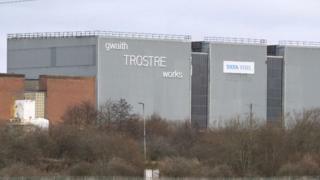 "Trostre is a major customer for Port Talbot. They all feed off each other; Shotton, Port Talbot, Trostre. They are all linked up so removing one bit is going to have a knock on effect for the other bit," he told BBC Radio Wales' Good Morning Wales programme. "This is clearly very significant." Plaid Cymru AM for Mid and West Wales Helen Mary Jones said the Welsh Government seemed to be "sitting on its hands". "We have raised concerns about this with the Welsh Government in the past precisely because this merger could lead to downgrading in Wales," she said. "I have tabled a question to the economy minister on this today and I expect him to take swift action to protect the thousands of workers in Llanelli who are facing uncertainty." Steelworkers union Community said if the reports were accurate, the proposal was "extremely concerning". Andrew Bragoli, senior union official, started work at the plant straight from school more than 40 years ago. He said the development came as a surprise - and after a year in which 100 new starters had been taken on, bringing a younger workforce. 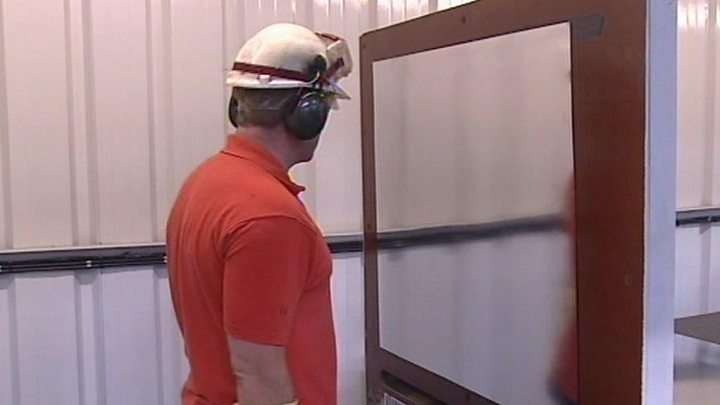 "It's the town, it's a major employer, it's not just the 650 working there, it's the contractors and the money spent in shops and the area - it would be drastic, I can't imagine if something happened to Trostre," he told BBC Wales. Tony Brady from Unite said they were very concerned the joint venture would become a partnership in name only, with Thyssenkrupp as the dominant partner. "Decisions over future investment would be made in Germany, and will very likely benefit continental plants at the expense of its UK operations," he said. Tata Steel said it had submitted a "comprehensive package of proposed solutions", with Thyssenkrupp, to the European Commission as part of the process to get clearance for the joint venture. "We continue to engage in a constructive dialogue with the European Commission and believe our proposals address their concerns, and still very much support the industrial logic of the joint venture," said a spokesman. "We're committed to working closely with all relevant regulators and remain confident of the benefits of the joint venture to all our stakeholders." The joint venture between Tata and Thyssenkrupp could give them over 50% of the steel packaging market in Europe. The European Commission was always unlikely to find that acceptable given the impact it could have on competition and price. So the prospect of Trostre being sold was always a possibility as part of the price of Tata and Thyssenkrupp's merger getting the go ahead. This is not a done deal. The proposal will now be consulted on. Trostre is seen as a very viable and profitable part of the business so it should hopefully be able to find a buyer.